Save water in the bathroom. Install water-saving aerators on bathroom faucets. Turn off the water while brushing your teeth and save 4 gallons a minute. 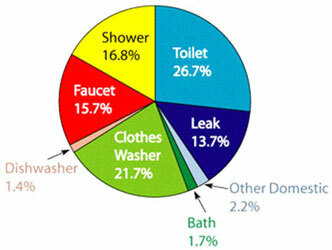 Save water in the kitchen & laundry. Install water-saving aerators on kitchen faucets. When washing dishes by hand, use a sink full of soapy water. Cook food in as little water as possible to retain more nutrients and save water. Defrost food overnight in the refrigerator or use the defrost on the microwave instead of running water to thaw meat or other frozen foods. Forty percent (40%) of our drinking water is used for landscape irrigation, making outdoor water conservation a top priority. Following these tips will maximize the effectiveness of outdoor watering at your residence or business, while also minimizing waste. Water lawns during the early morning when temperature and wind speed are the lowest to reduce evaporation and prevent waste from high winds. Use a rain gauge to measure the amount of rain or irrigation the yard receives. Choose drought-tolerant plants when landscaping and group plants with similar water needs (known as hydrozoning) together. Set a good example with your water conservation practices at home, work and anywhere else that uses water. Use commercial carwashes that recycle water.